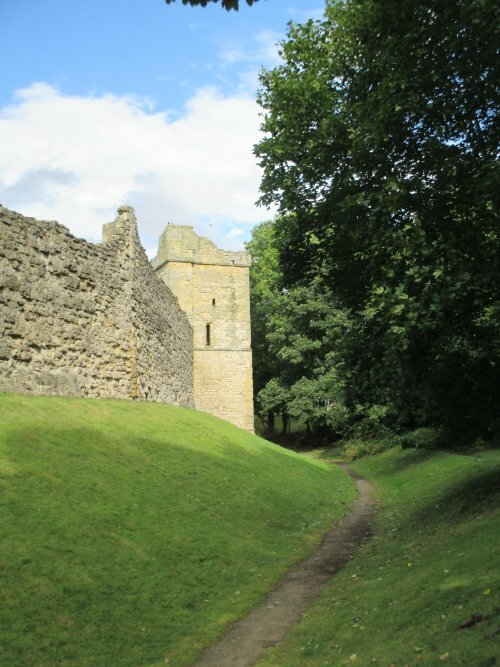 The castle entrance waits patiently in the winter sunshine for the onslaught of the summer tourists. 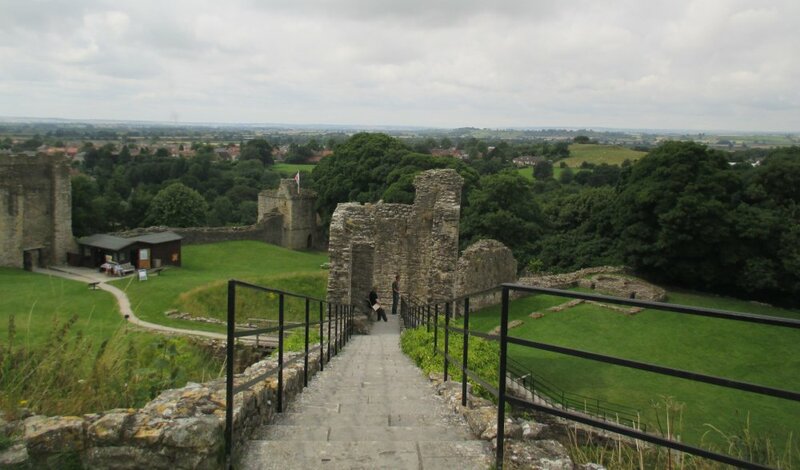 The original castle was built by William the Conqueror in 1069-70. 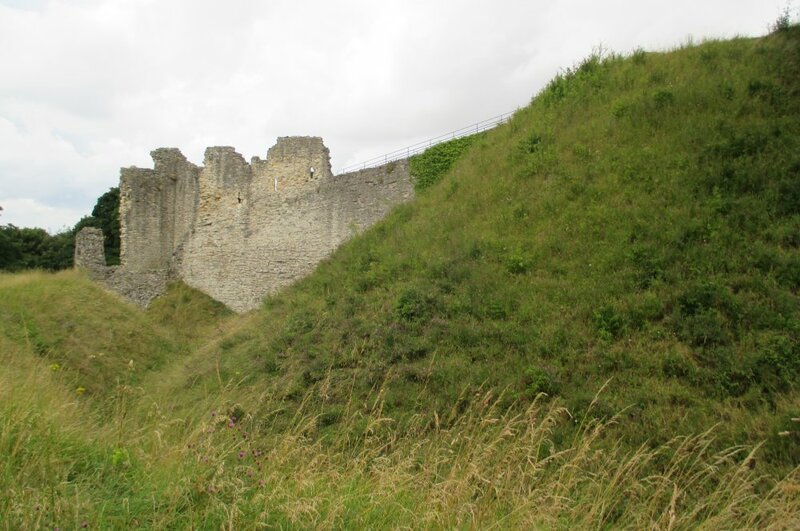 Most of the surviving buildings on the castle mound date from the 12th (C12), 13th (C13) and 14th (C14) centuries (~1180 to the early 14th century). 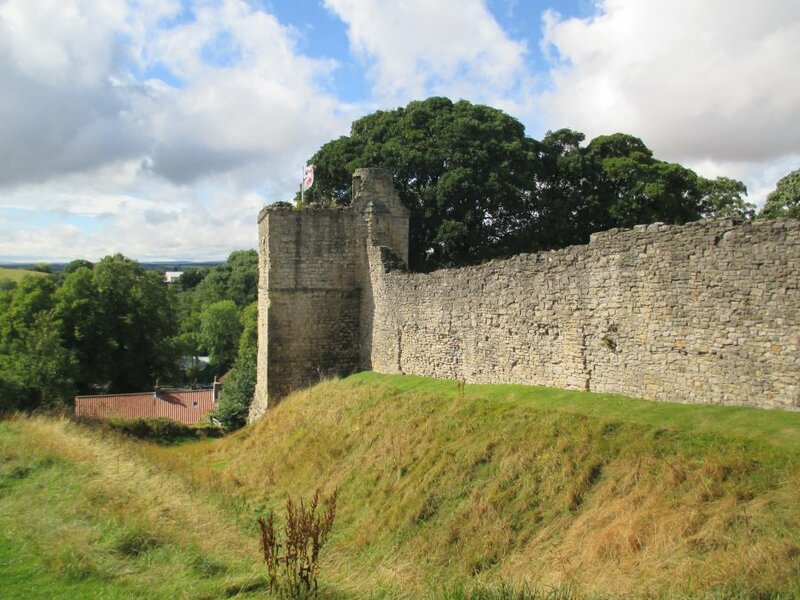 All the English kings of the period sponsored the development of the castle for several reasons including the fact that north of the castle were large forests for 'Royal Hunting'! 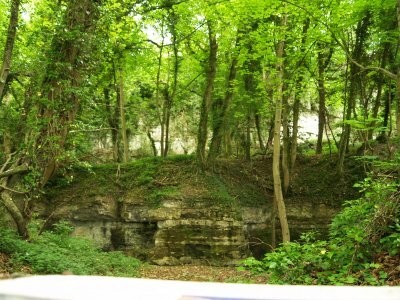 - wild boor, native red and roe deer, and the Normans added fallow deer for good measure and there was plenty of prey for falcons and hawks! 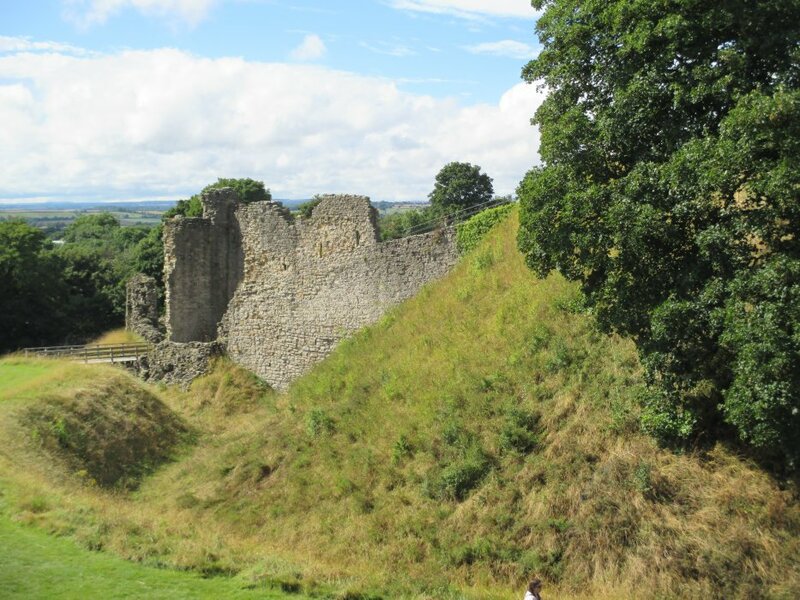 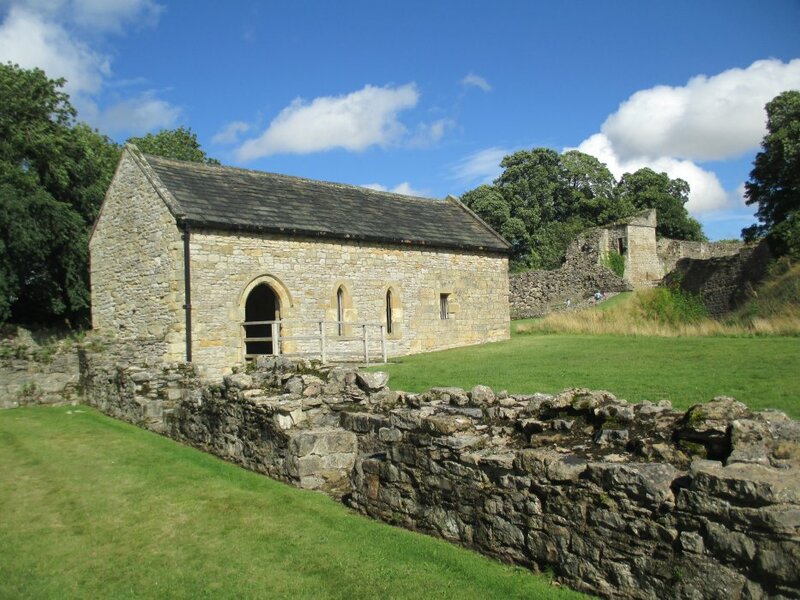 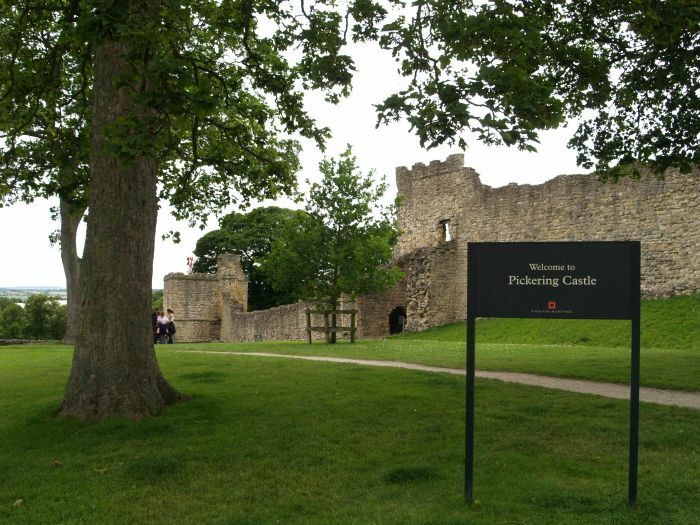 Even from the late 12th century, Pickering Castle was an important medieval administrative centre. 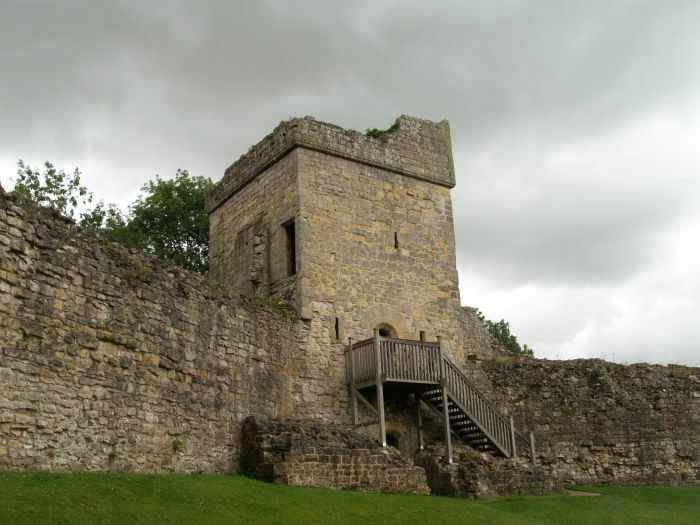 King Edward II had the castle strengthened as further protection against marauding Scots. 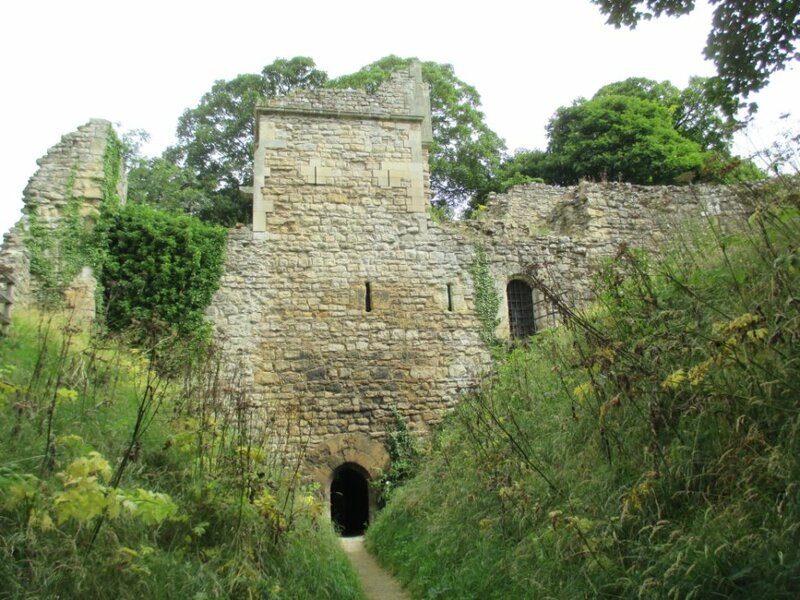 The Mill Tower on the left, one of the square projecting towers, and the entrance on the right into Pickering Castle. 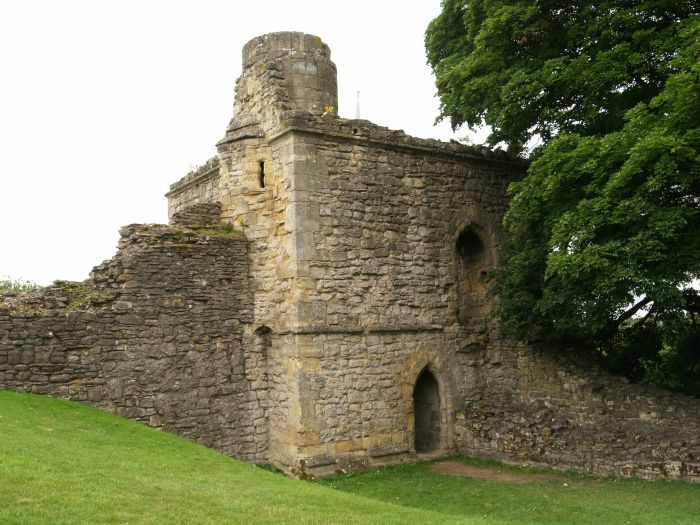 Pickering Castle is built on a solid outcrop of limestone, part of which, on the west side, was quarried to provide the stone masons with their raw material. 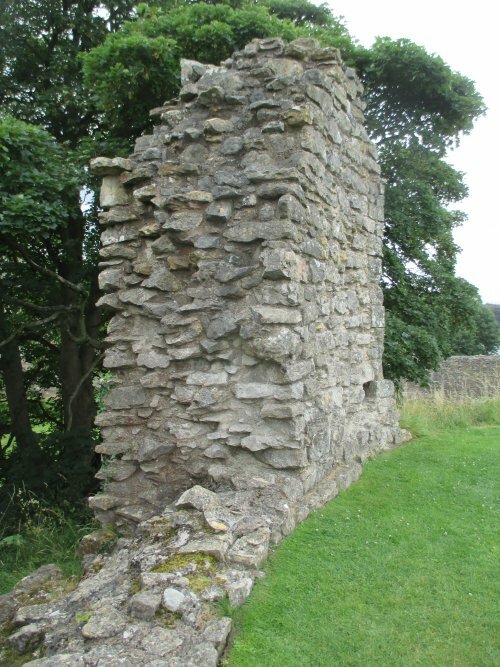 The castle was maintained from a large estate which provided timber, stone, fish and game - the nearby agricultural was relative poor land. 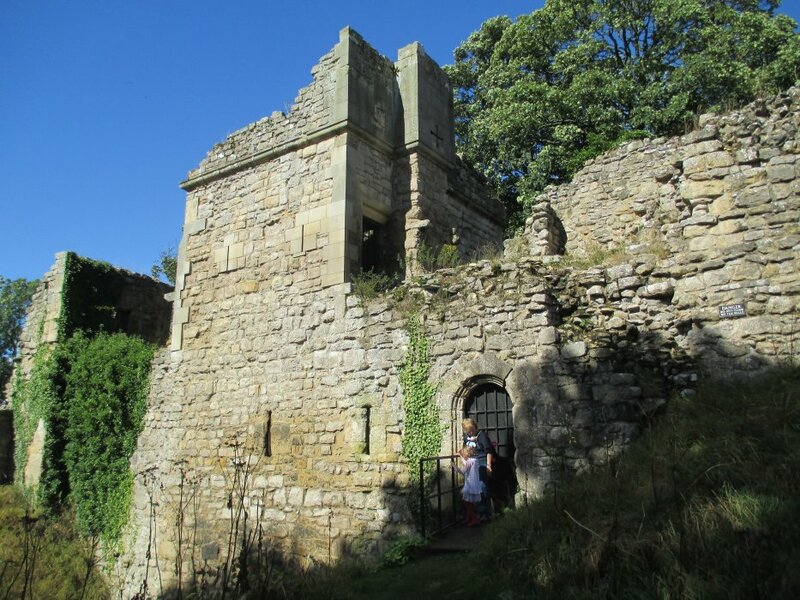 By 1400 the rich estate was managed by the 'Constable' who lived in substantial lodgings in the castle grounds. 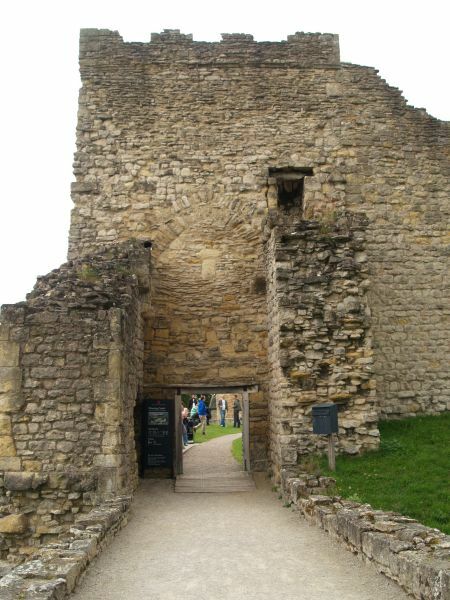 The entrance to Pickering Castle which is managed by English Heritage. 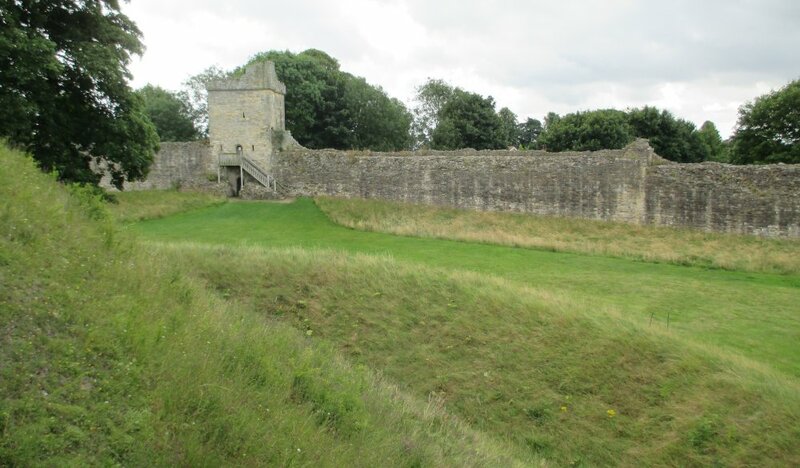 The defensive ditch running down my Mill Tower, your left-hand view as you enter Pickering Castle. 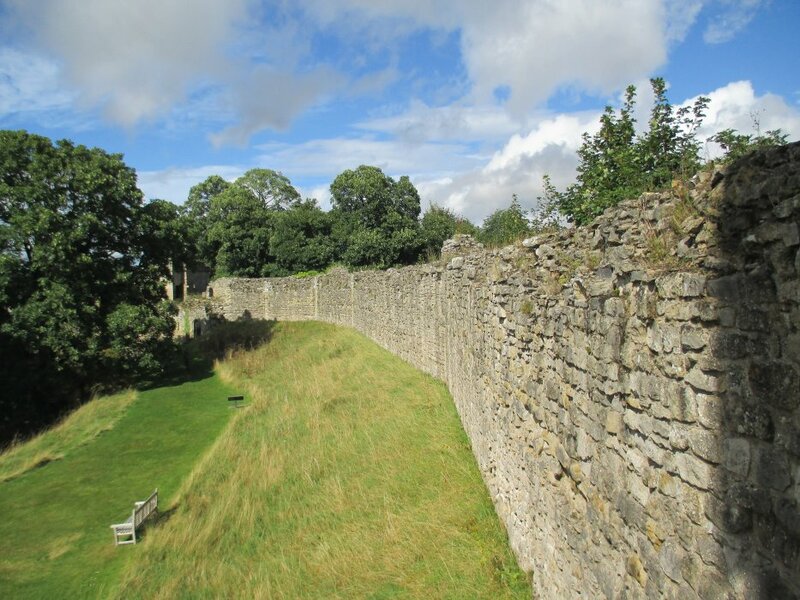 ... from the inside - viewed from inside the outer bailey. 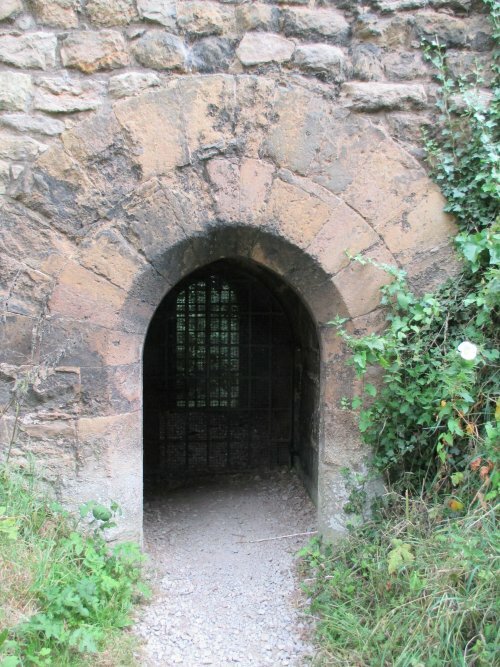 The entrance leads into the kidney-shaped outer bailey. 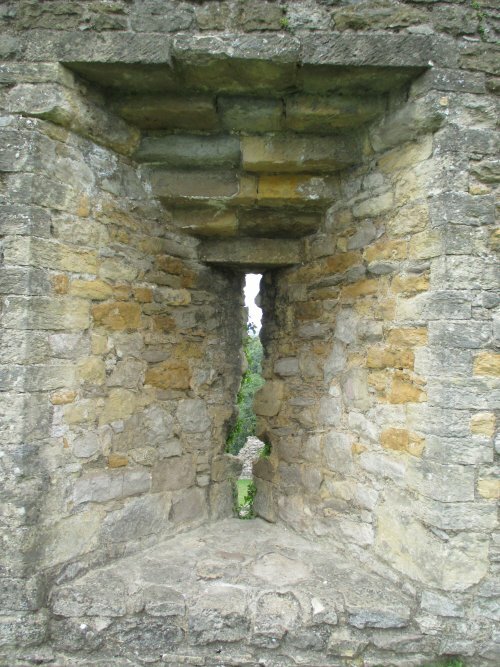 Details of the Mill Tower of Pickering Castle. 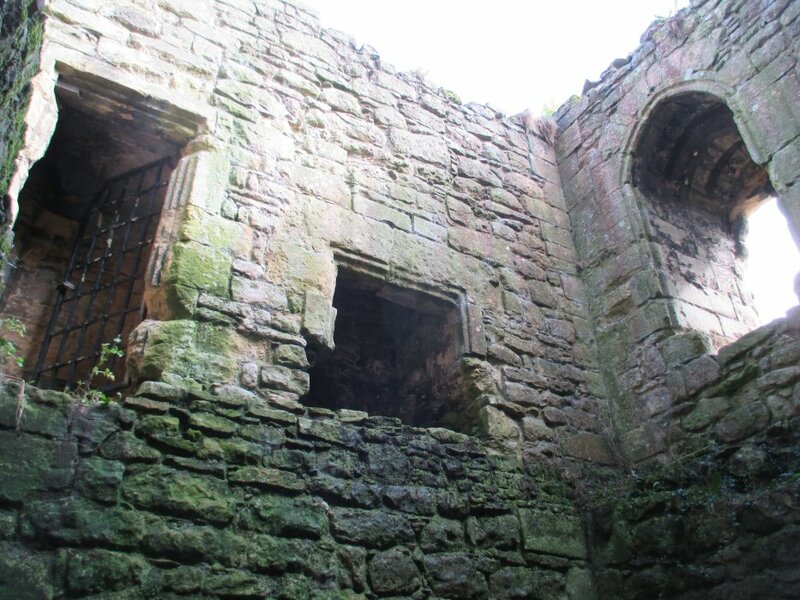 More details of the door ways and windows of the Mill Tower of Pickering Castle. 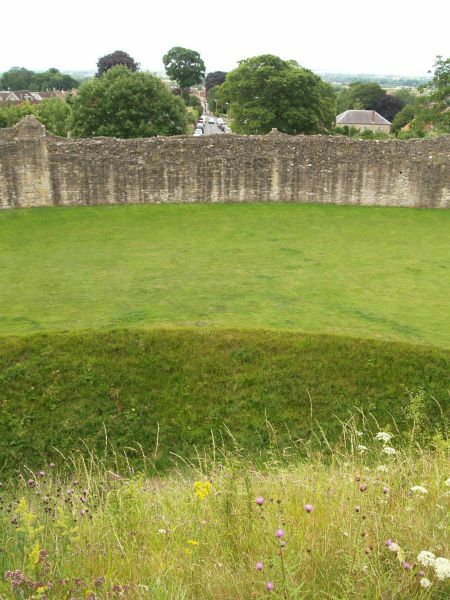 In the foreground the late 12th century ditch protecting the inner bailey (beyond the walls on the left), remnants of the inner bailey wall on the left, in the centre the Coleman Tower and beyond the motte. 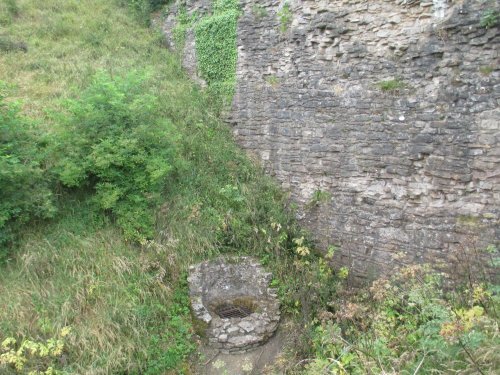 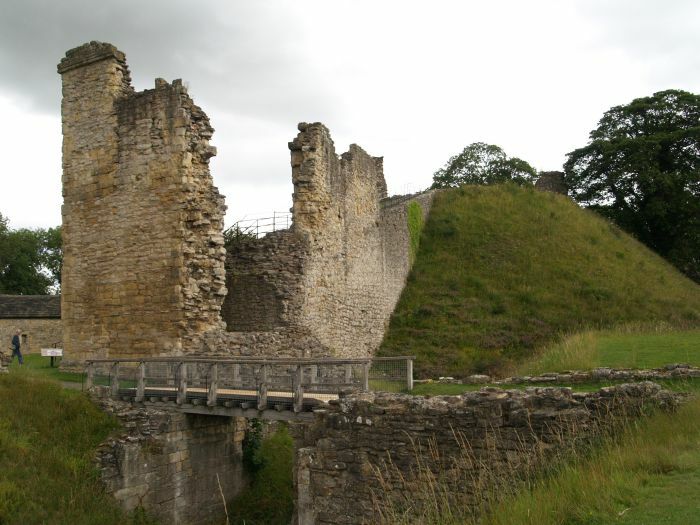 The current footbridge site of Pickering Castle was made into a drawbridge in 1323. 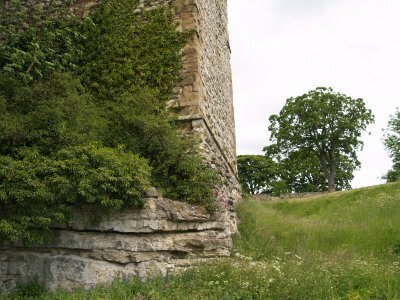 The Coleman Tower (from the 1180s, late 12th century), ditch and motte of Pickering Castle. 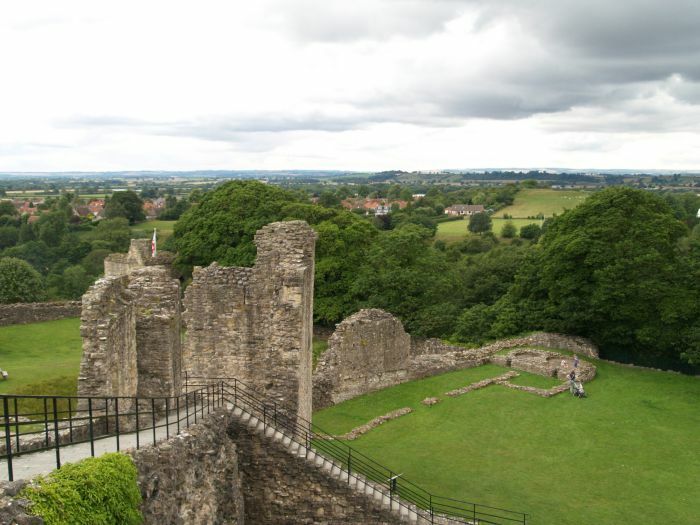 View down from the motte (mound) to the Coleman Tower (built by Henry II) - the outer bailey on the left and ruins of buildings in the inner bailey of Pickering Castle on the right. 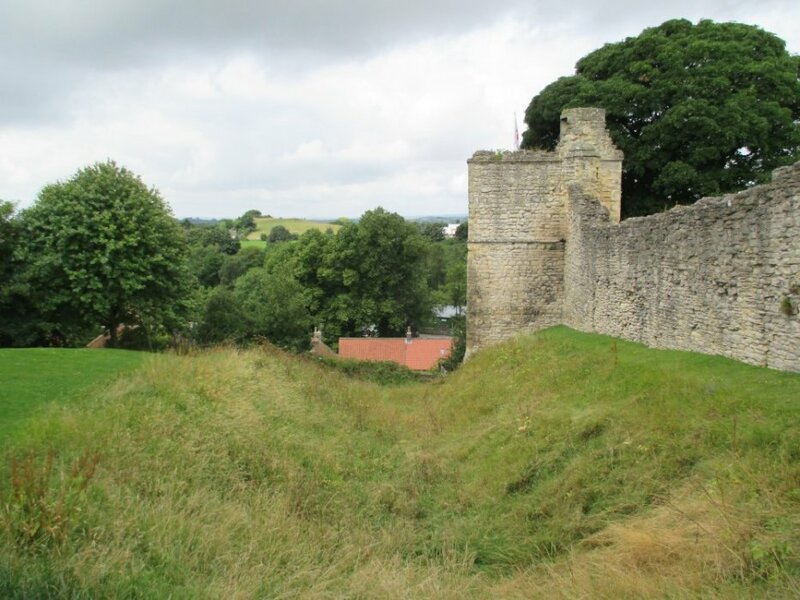 Looking down from the 43ft (11m) hill of the motte into the inner ditch (or moat), the outer bailey, the outer curtain wall and beyond it Castlegate, which leads down into the town of Pickering. 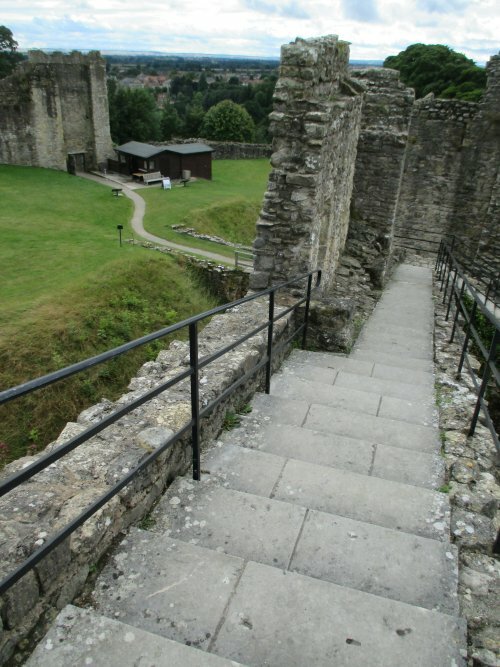 Looking down the steps from the Coleman Tower, to reach the top of the motte and ruins of the Keep of Pickering Castle. 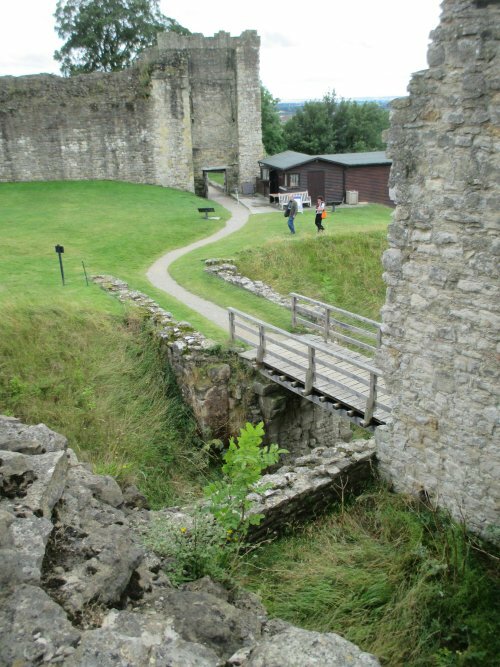 Another view from the top of the motte - the Coleman Tower and inner ditch or inner moat. 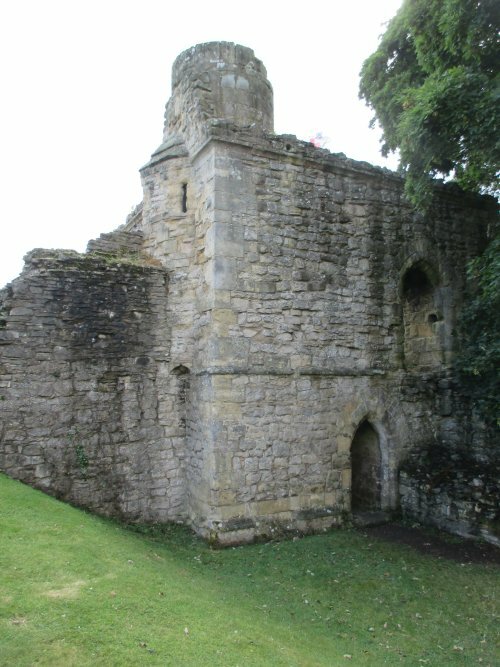 Traces of the base of the shell Keep (the 'Royal Tower' built by Henry III) can be seen on the right. 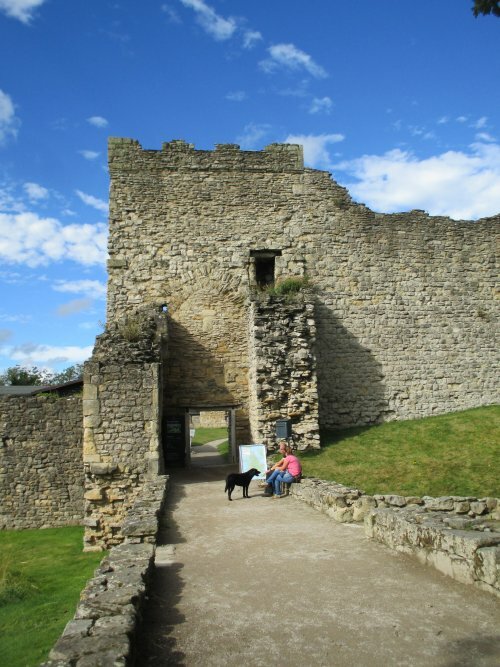 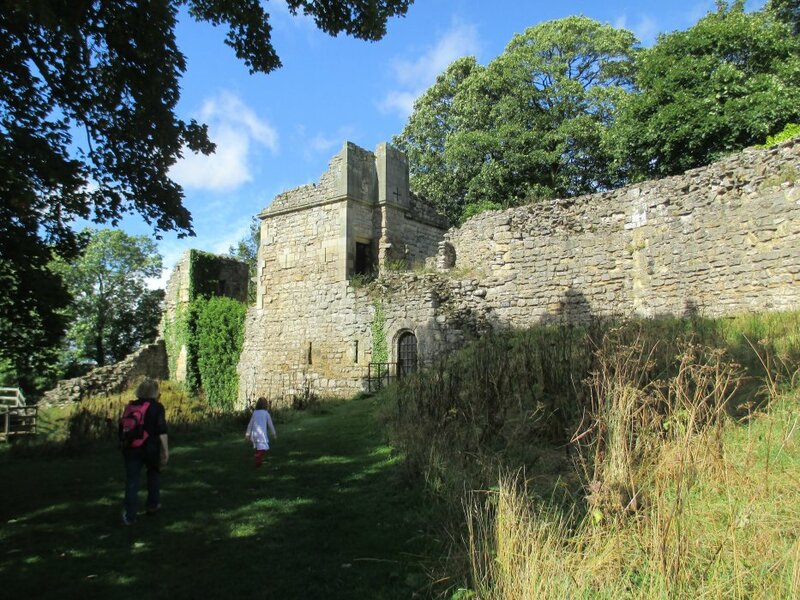 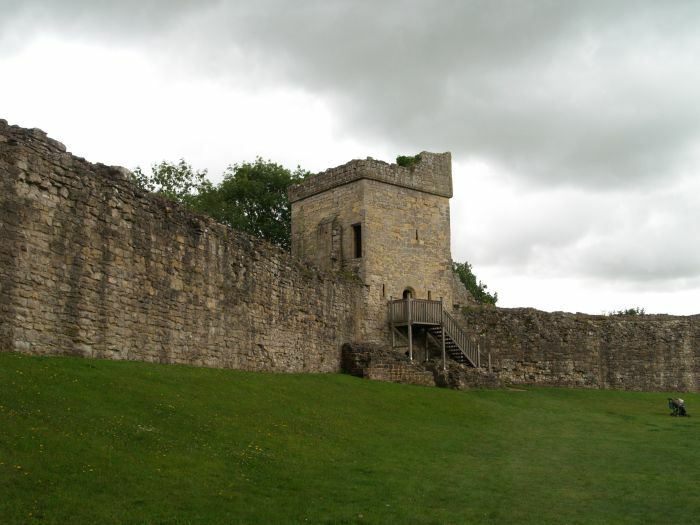 The stone Keep of Pickering Castle was built around 1220-1230. 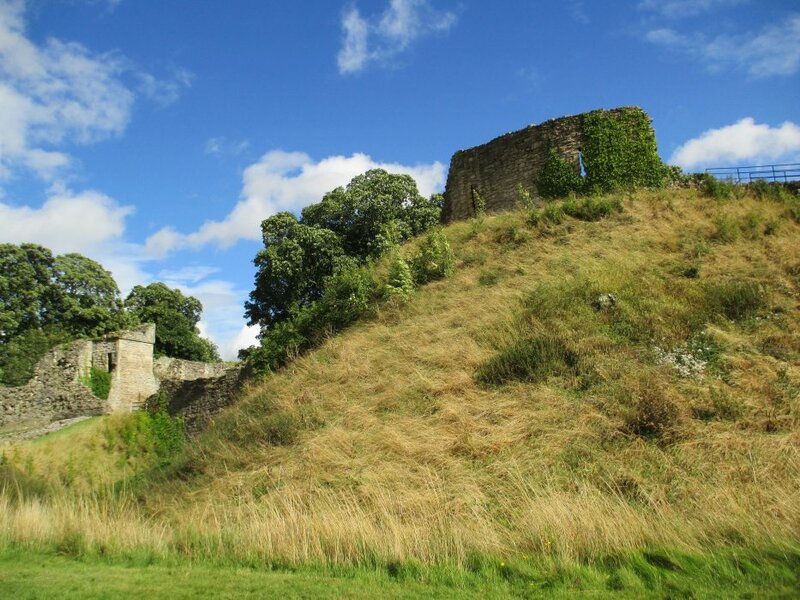 Looking up the motte to the ruins of the Keep of Pickering Castle, Rosamund's Tower on the left. 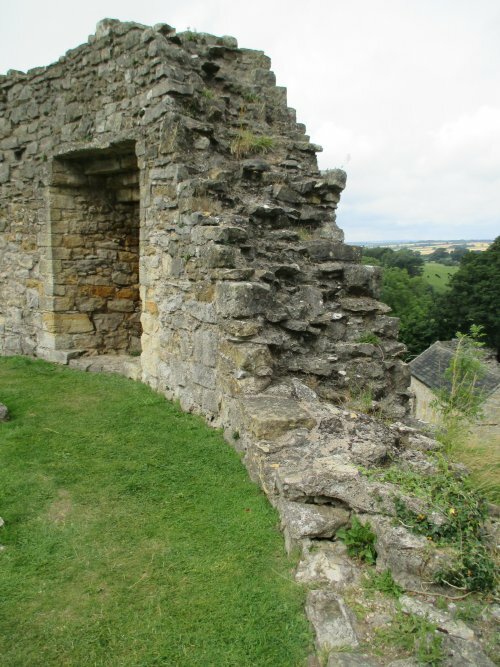 The main section of the sparse remaining walls and windows on the top of the motte of Pickering Castle. 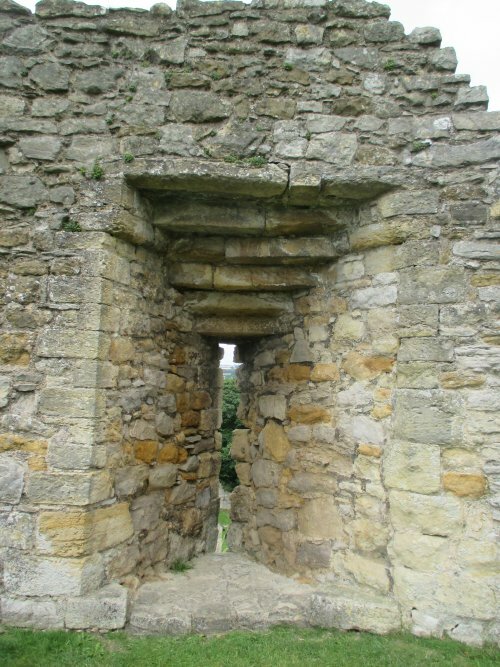 Details of the recessed defensive slit keep windows and thick walls of the Keep of Pickering Castle. 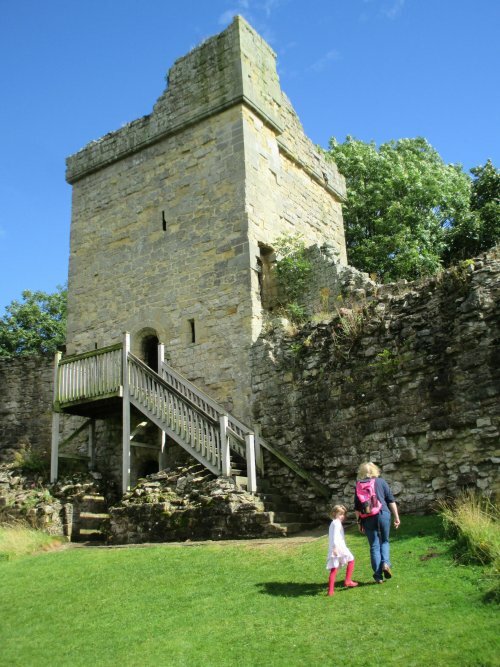 The late 12th century Coleman Tower of Pickering Castle, which once held a prison, and protected the bridge over the inner ditch. 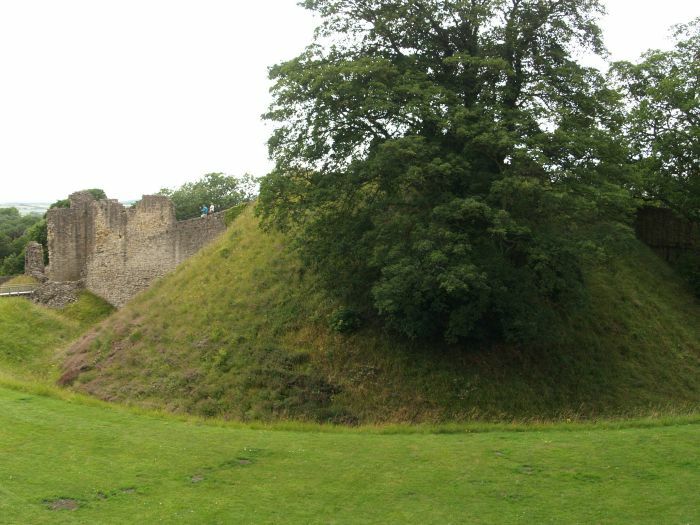 The steep sided motte of Pickering Castle, with its own protective ditch, the Coleman Tower and the ramp-steps to enable the keep on the motte to be reached. 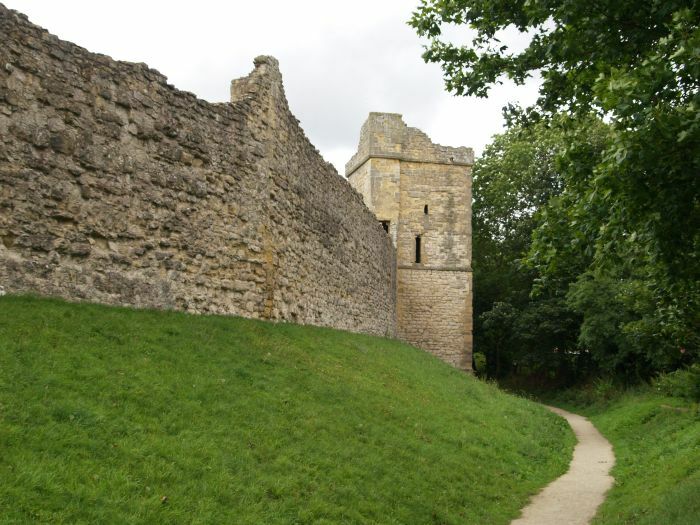 The ditch between the motte and the inner bailey of Pickering Castle, with the Coleman Tower on the right. 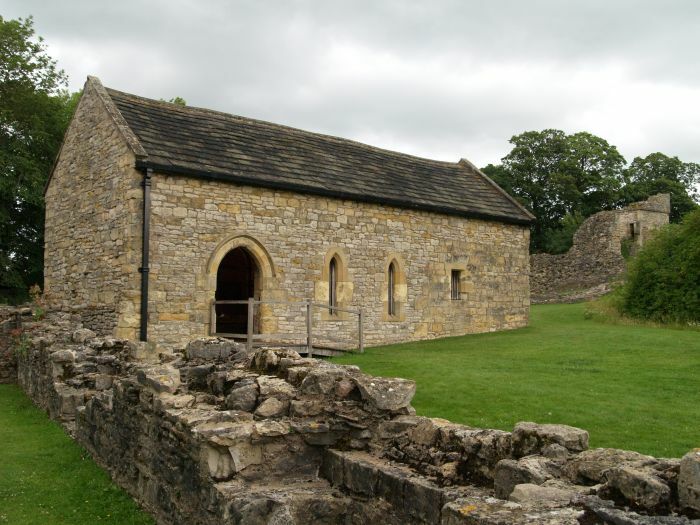 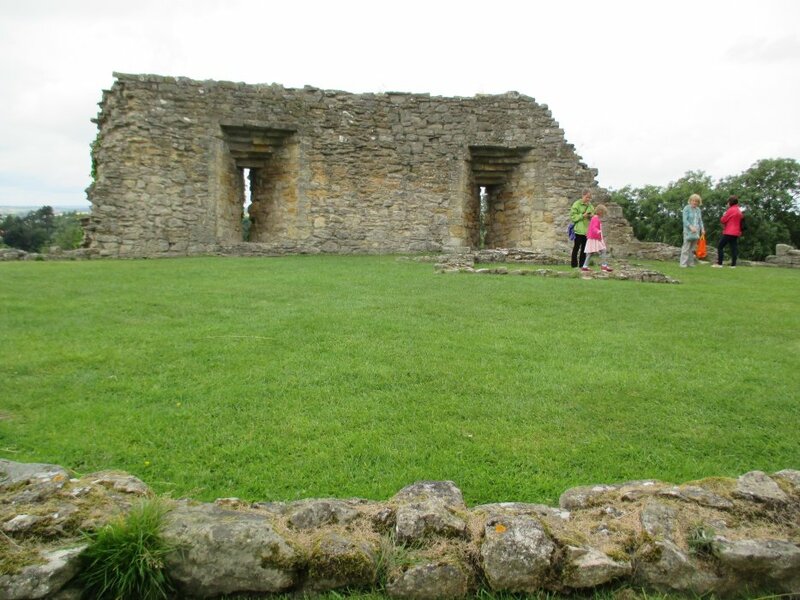 The 'very restored' Chapel of Pickering Castle. 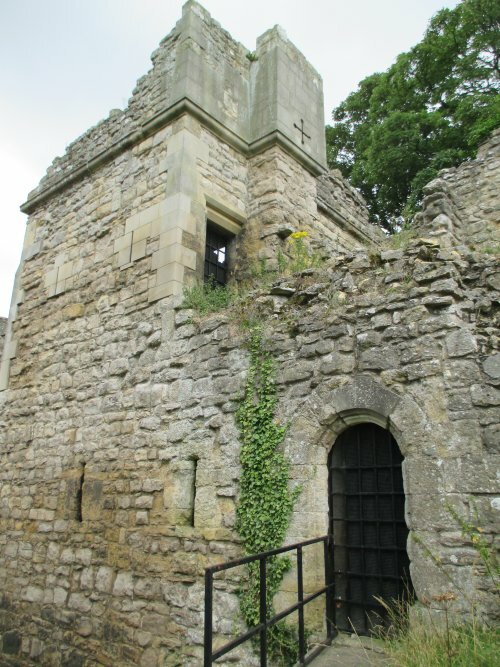 This simple building is dedicated to St Nicholas and dates back to ~1226-1227 and has small simple lancet windows. 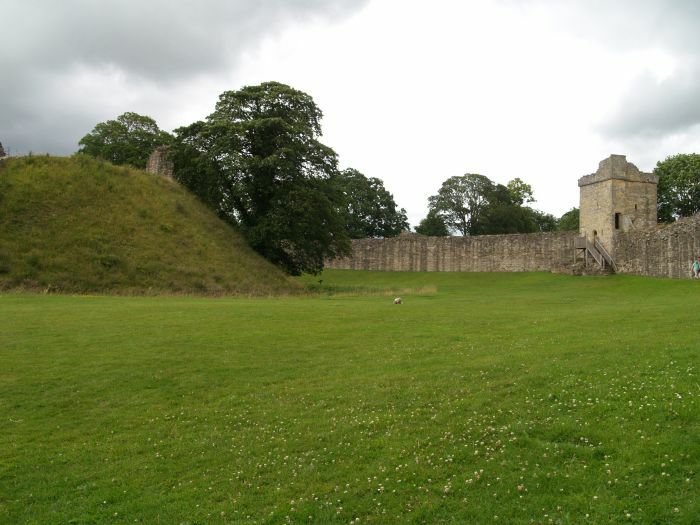 Rosamund's Tower is on the right. 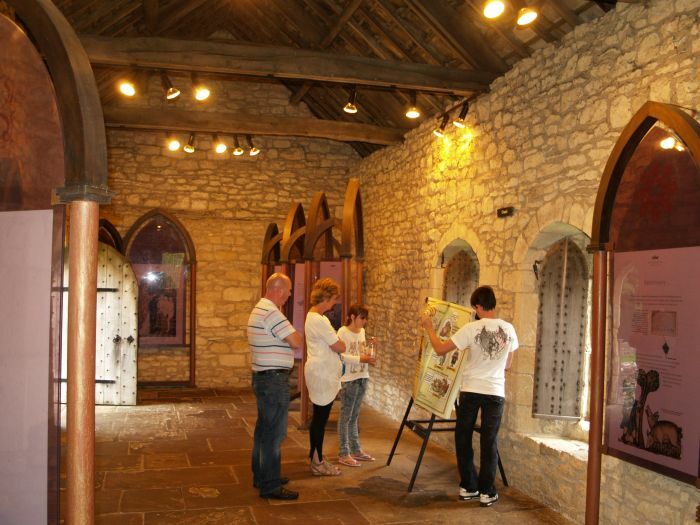 The chapel has been converted into a tourist information centre to depict and explain the history of Pickering Castle. 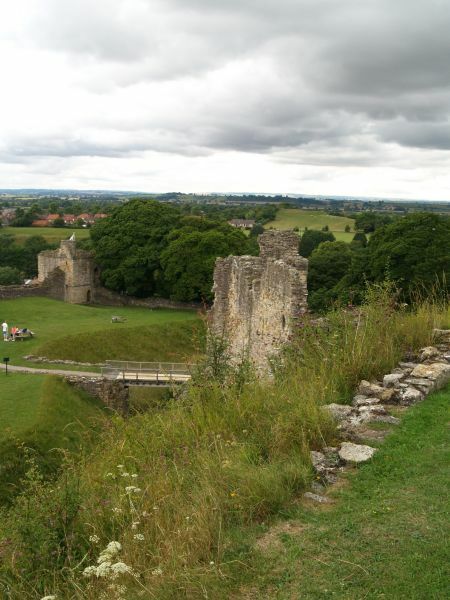 View of the motte and keep ruins from near the chapel in Pickering Castle. 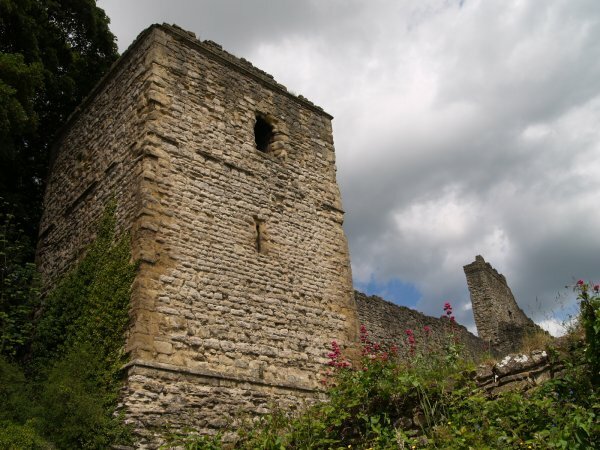 Rosamund's Tower, the most northernmost tower of Pickering Castle. 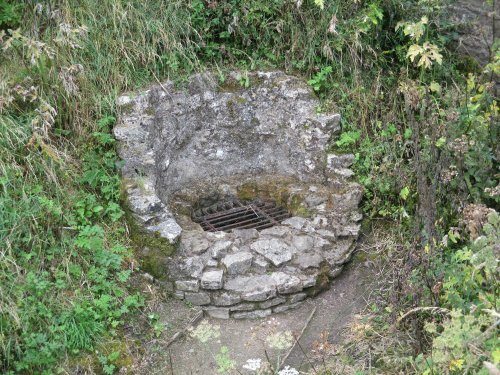 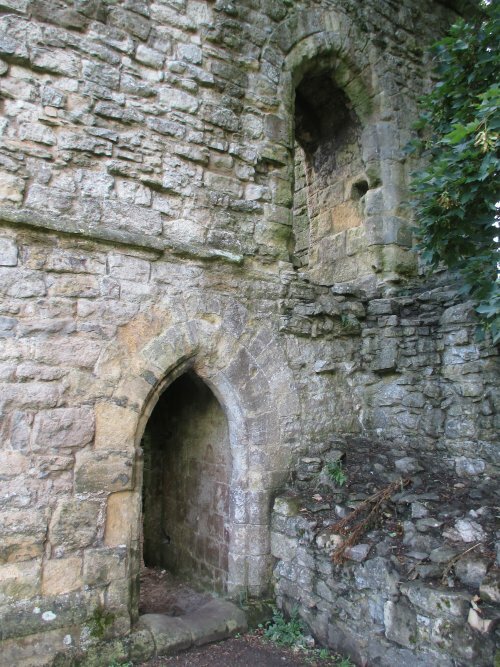 The basement of Rosamund's Tower has an archway with a pointed chamfered arch which forms a postern gate to the outer ditch - a nice little architectural feature of Pickering Castle. 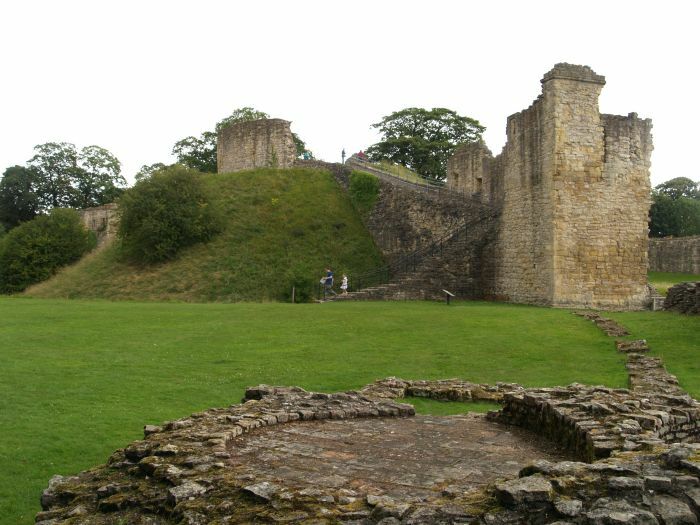 The main doorway is on the upper right and is round headed, despite being later than the 'Romanesque' period of early Norman architecture of Pickering Castle. 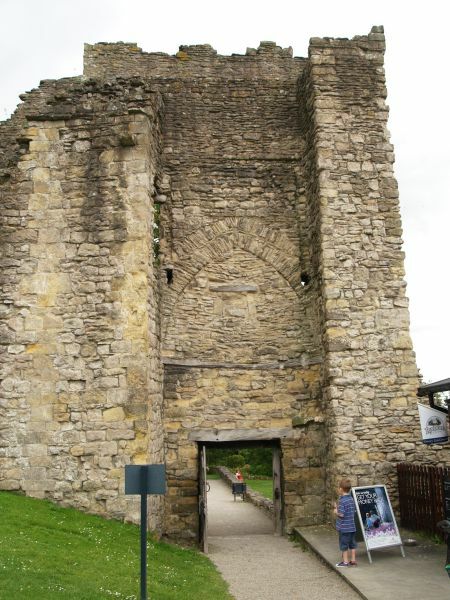 The Postern gate and other entrance to Rosamund's Tower in the bailey of Pickering Castle. 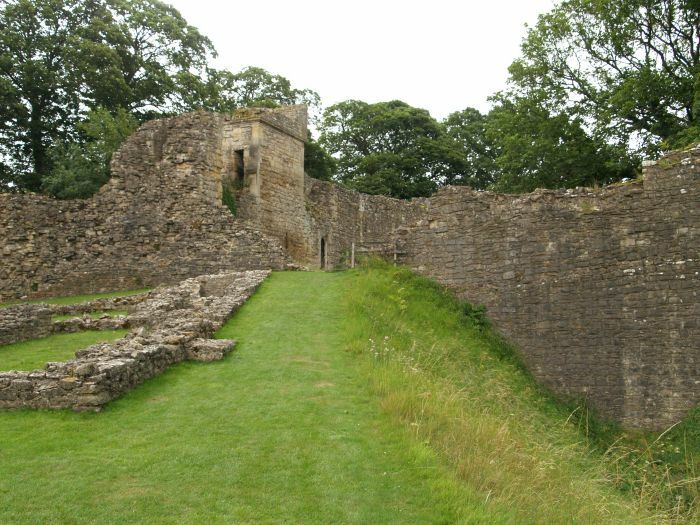 The square Diate Tower in the south east side of the outer bailey and the outer walls of Pickering Castle. 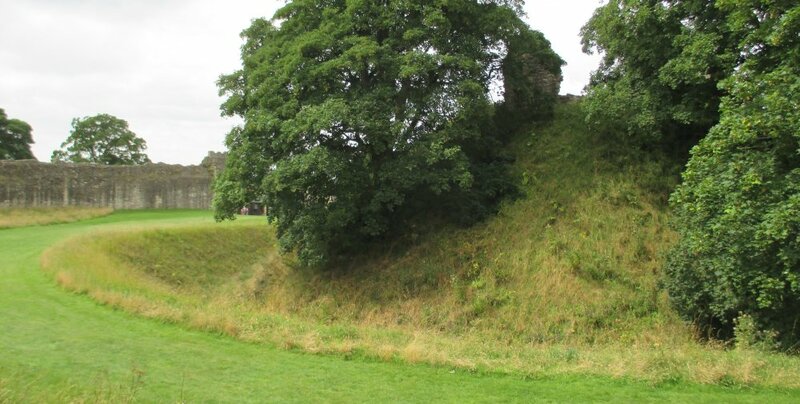 View of the tree overgrown motte ditch of Pickering Castle. 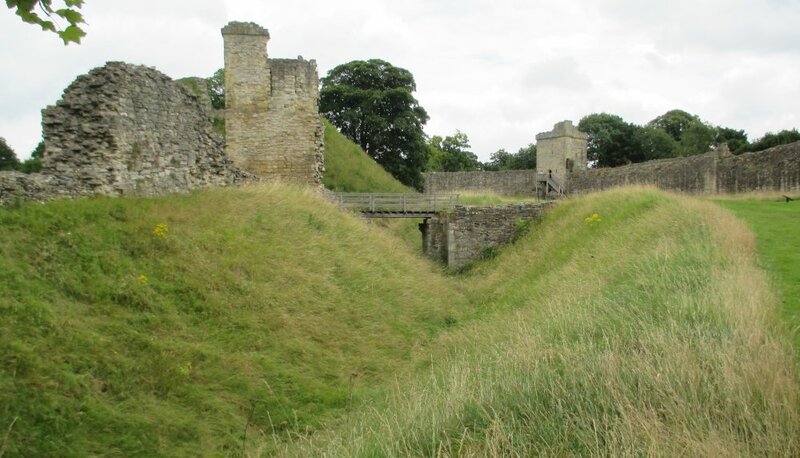 View of the Motte ditch looking towards the Coleman Tower of Pickering Castle. 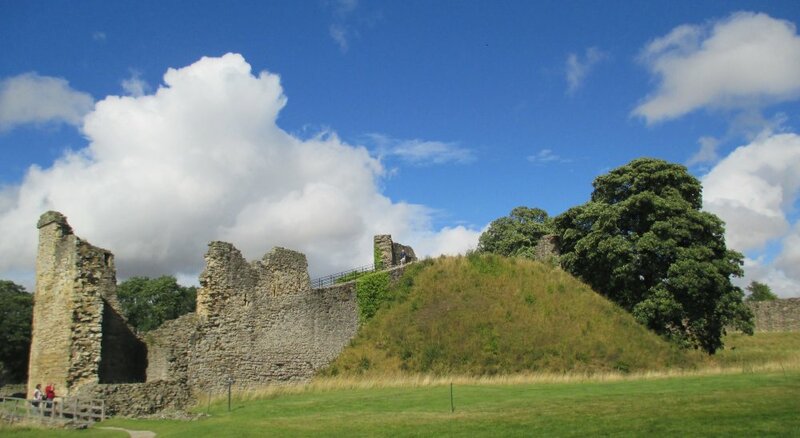 View of the motte from the south-east of the outer bailey and on the left the inner bailey walls and Coleman Tower. 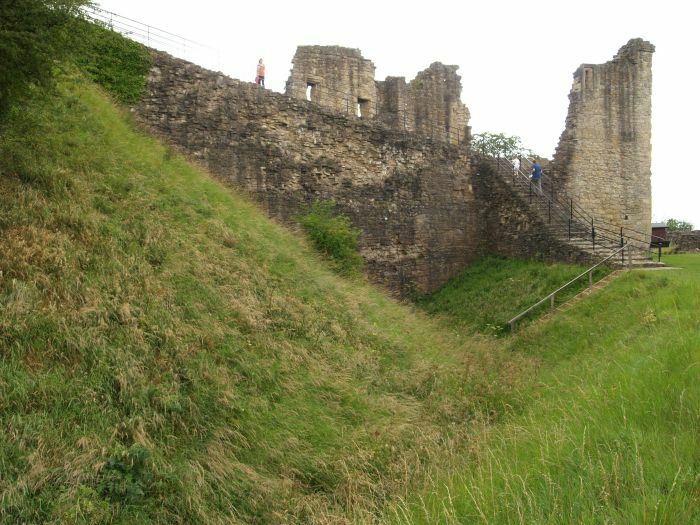 The southern section of the outer bailey enclosed by the outer curtain walls - motte on the left and Diate Tower on the right. 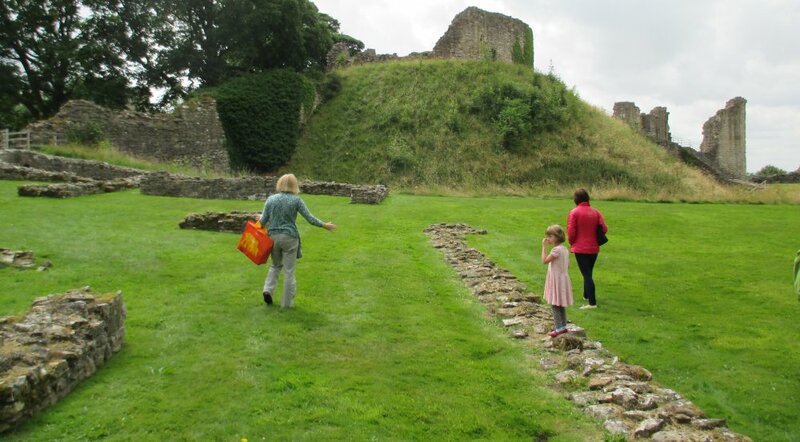 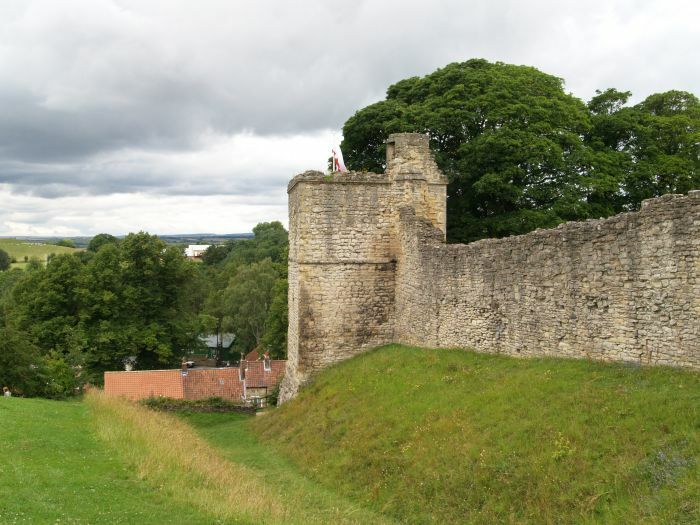 The outer wall protected the 'outer ward' or 'outer bailey' and was built in the early 14th century by King Edward II.